These four Colorado visual artists had their works selected by our poets, who in turn had their works selected by our composers. Healing and personal narrative are strong themes in my art. I work intuitively, with my healing and my artwork moving in step with one another, trading off the lead. While I often create work that is directly related in subject matter to the issue needing healing, healing can also originate from the creative process or from the respite of being submersed in my work. Aspects of my work are repetitive and meditative, allowing for balance, harmony, and the healing connection of the body, mind and spirit. The lungs are one of a series of thread sculptures depicting eight organs. All of these organs were affected by an illness that almost cost me my life. In Chinese medicine, our organs are each associated with a particular emotion. As I sculpted the organs, I worked to heal the associated emotion while exploring the delicate and resilient nature of our bodies. This is embodied in the nature of the fiber and the process, which involves molding the thread on the organ form, cutting the fibers to release it then re-stitching the organ. This act of mending is an act of healing myself. Grace Gee seeks to create art that challenges the mind and nourishes the spirit while providing avenues to engage in a changing consciousness. She works in a variety of media including sculpture, fiber, artist books and installation work. Her work is influenced by her bi-cultural upbringing and is strongly rooted in spiritual growth, healing and transformation. Grace is a first generation Chinese Canadian who now resides in Louisville, Colorado. She has lived and worked in Canada, the US and Hong Kong, and has traveled widely in Europe and Asia. She holds a BA in Psychology and an MA in Conscious Evolution. I consider my primary medium to be space. Space inspires and intrigues me, quite literally, from the perspective of physics, as that which connects all that appears in “the material world.” It also may be understood or imagined to connect the material to the unseen and/or spiritual realm(s). I suspect that its nature is ecstatic. Around this primary exploration, the character or personality of the physical medium is also strongly present in the work. 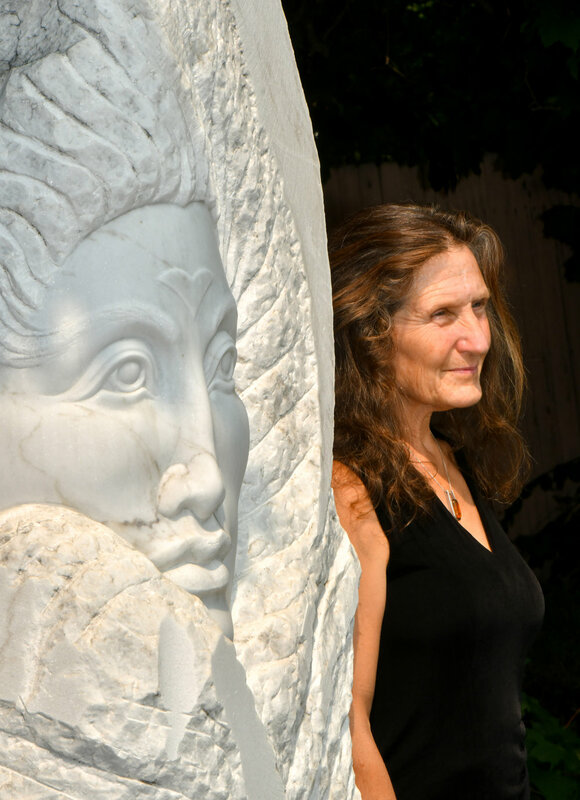 With stone, I feel that the piece chooses me as much as I choose to bring it to the studio. I preserve as much as possible of the overall gesture and significant features of each individual stone. Doing this work is thus for me a direct way of conducting my relationship with Universe.